It’s a student’s dream, Everything associated with your course all in one portable place, iTunes U offers over half a million free lectures, videos and books across thousands of different subjects. It works as a brilliant portal tor even the smallest details. As well as access to all types of multimedia content, you can view presentations and scroll through PDFs. iTunes U lets you browse from a collection of 26 countries, but expect that figure to rise as word spreads. However, iTunes can be used by anyone. If you’re keen to study, a simple search in the app’s catalog will give you the opportunity to download a whole host of courses. Learning has never been this much fun – or as cheap. 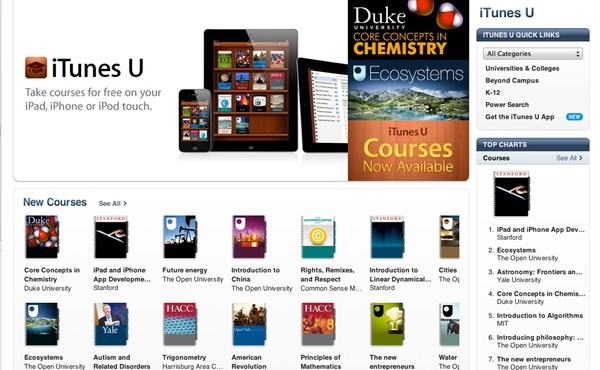 Simplicity is at the heart of everything Apple does, and iTunes U’s no different with its clean, intuitive Ul. The app requires iOS 5.0 to function and comes with full iCloud syncing abilities. Here we guide you through the sign-up process. Install the app from the iTunes App Store. When it has downloaded, click the app’s icon to load. You will automatically be taken to your Library, which looks very similar to the Newsstand app. Tapping on the central dialog box will send you straight to the app’s massive selection of free courses. Once you’ve been directed to it, you can begin the search for your desired subject. You can search via the What’s Hot tab. or through Categories for a genre-defined search. When you’ve pinned down the course for you, select it to be taken to more in-depth details. After indulging in the extra detail, and if happy with your choice, hit the Subscribe Free box under the course’s title and then Get Course. It will now be added to your own Library. Your course will appear in your bookshelf ready to be studied, Simply pressing on the cover will open a range of options to explore on an Info screen, including an overview and instructor profile. If you press the Posts option, you get access to everything that has been posted by the lecturer. This is the main learning hub, with everything laid out in a chronological fashion. Happy learning!